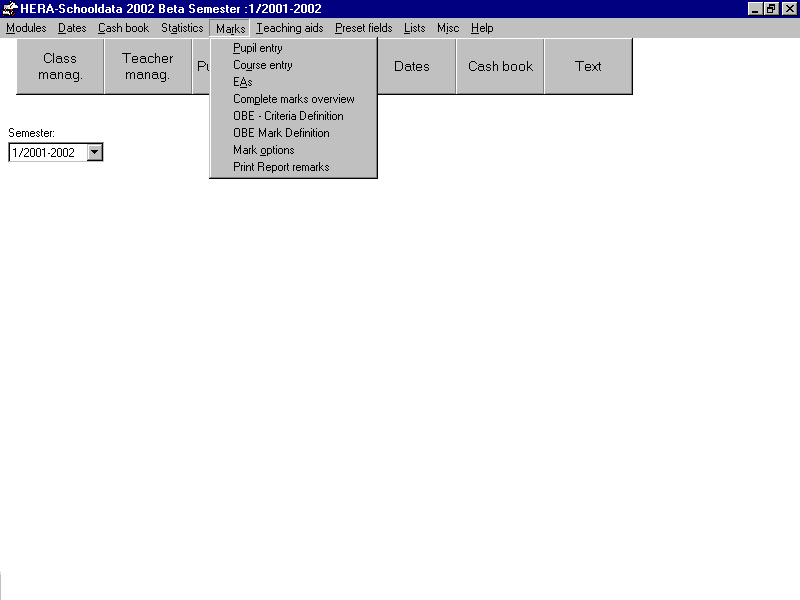 This is the main menu for marks management . For a description of the buttons please scroll down. : It has open a menu for adding,editing of reminders. : It will open a window for Adding and Editing marks of pupils. : It will open a window for Adding and Editing marks of class/course. : It will open a window for Adding and Editing marks/grades for extracurricular activities. : It will open a window giving overview of marks obtained by selected pupil in all courses. : It will open a window for giving criteria for adding weightage and maximum points for each exam. : It will open a window for giving criteria for grades according to marks. : It will open a window giving options available for printing marks . : It will open a window for printing reports of pupils. : It will open a menu for writing Letters,entering Users,importing/exporting databases, promoting pupil etc.